Before Powerpoint, people used to design presentations. No Microsoft template here. I’m not saying this is great design, but it’s better than 90 percent of the powerpoint presentations, I’ve had to sit through and/or design myself. This is a sales presentation for the latest version of the addressograph system for Department of Motor Vehicle Use. Seems this particular presentation was designed for a very niche audience, Michigan DMV. I hope they made the sale. 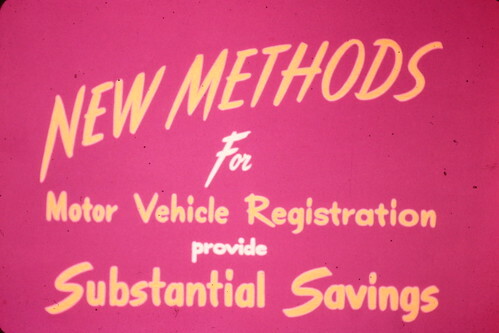 I know after I scanned and watched these I was ready to see my 130K in savings per year in vehicle title processing. It seems this machine is a distant relative of one of my favorite business machines, the credit card imprint maker or as I like to call it: The Gas Station KaChunk machine. When I worked retail, I loved using that thing and then electronic card readers, card swipers, chip inserters and Square had to ruin everything.